Today we are featuring projects by Maria and Zsofia! 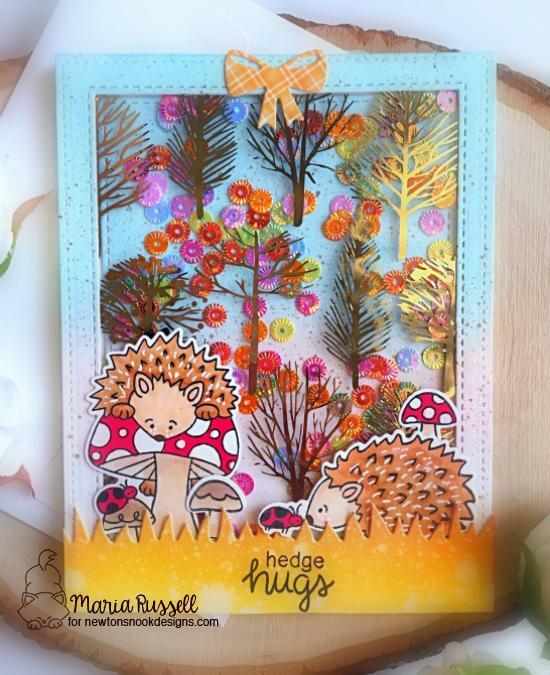 Maria created this adorable card featuring those sweet hedgehogs from our Hedgehog Hollow Stamp Set. She colored the hedgehogs, ladybugs and mushrooms with copic markers and then cut them out with the coordinating Hedgehog Hollow Die Set to add to her card. Behind the hedgehogs she created a gorgeous shaker window. She used the Deco Foil Designer Toner Sheets (Wilderness) from with Gold Deco Foil from Therm O Web to create the sparkly tree pattern. She used this for the front of the shaker and framed it with a die cut frame and filled it with sequins. She added a bow on top that was cut out using our Pines & Holly Die Set. She also added a layer of golden inked grass along the bottom using our Land Borders Die Set to complete the Fall scene! For her second card, Maria utilized the piece of foil that was leftover from using the the first card when she used the Deco Foil Designer Toner Sheets (Wilderness) from Therm O Web! You can use these fun leftover pieces to get the most out of your foil! she covered her card in this piece, gluing it over a pale blue background. then she added that cute hedgehog along with some mushrooms from our Hedgehog Hollow Stamp Set across the center of the card. She used the coordinating Hedgehog Hollow Die Set again to cut them all out. She finished off the card with the "thankful" sentiment from our Thankful Thoughts Stamp Set. So lovely! For her first card, Zsofia created a lovely winter scene featuring our Winter Memories Stamp Set. She added the skating couple and tree images from the set, cutting them out with the coordinating Winter Memories Die Set. For the sparkly snowy background she used our Petite Snow Stencil along with Deco Foil Transfer Gel and Opal Deco Foil from Therm O Web. She added cut out the word "Christmas" using our Holiday Greetings Die Set with Deco Foil Peel N Stick Toner Sheets and added foil using Gina K Glittering Green Fancy Foil. She also used our Frames & Flags Die Set for the fun scallop edged border. 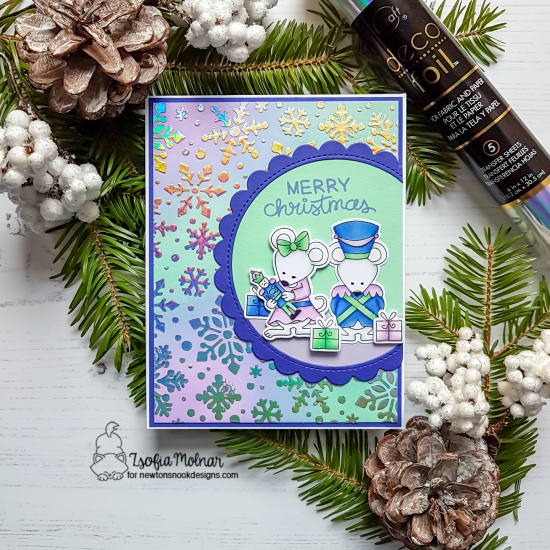 For her second card, Zsofia featured the cute little mice from our The Nutcracker Squeak Stamp Set, coloring them in lovely shades of purple, blue and mint. She cut them out using the coordinating The Nutcracker Squeak Die Set to add to her card. 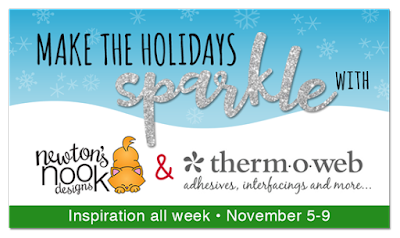 For the gorgeous snowy background she used our Snowfall Stencil along with Deco Foil Transfer Gel and Iridescent Deco Foil from Therm O Web. This foil gives such a pretty look when it catches the light! 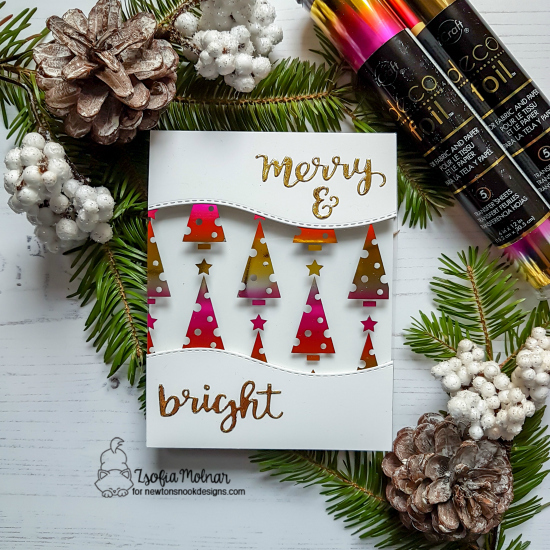 For her third card Zsofia created this sweet holiday tree card! She used She used the Deco Foil Designer Toner Sheets (O Christmas Tree) from with Summer Rainbow Deco Foil from Therm O Web to create the sparkly tree pattern. She created a curvy cut on her card front top and bottom using our Land Borders Die Set. Then she added the die cut words on top and bottom using our our Holiday Greetings Die Set with Deco Foil Peel N Stick Toner Sheets and added foil using Gold Deco Foil. Such fun bright holiday colors! Visit Zsofia's blog: safsafdesign to see more and leave a comment for another chance to win! Adorable hedgehog and mice cards and love the skating scene. These are incredible! Love that Maria used both pieces for her two cards...love it! Zsofia..wow...love that foiled background and that Summer Rainbow Deco Foil is one of our favorites..perfect for a bright, colorful holiday card! I love how the foil looks on these projects! This foil is just amazing! Adds so much to the cards! Fabulous cards! I love Maria's hedgie cards! The Wilderness toner sheet design is gorgeous! Zsofia's holiday cards are a delight! Maria's first card is so full of LIFE!! And glorious color and adorable hedgies. Love that card! And Zsofia's card are lovely. I especially love the trees and the design of that card. So unique, I think. Fabulous cards, love those clear toner sheets. Love all the sparkle. Beautiful!! Such fantastic cards! Love all the foiling. The backgrounds and details are amazing!!! These are so gorgeous projects!